A betrayal of public trust, with abuse directed against the most vulnerable and powerless. What to make of the cases of Tamir Rice, Sandra Bland, John Crawford III, Sam DuBose, Eric Garner, and a slow-motion litany of far too many others? We might begin by standing with citizens of all races who reject the highly problematic notion, applied variously in each of these cases, and no doubt many future ones, that this is what police “had to do.” As the father of four children, two of them black as the beautiful night, pondering the cases of Tamir Rice, in particular, and then Sandra Bland, I begin to understand and feel ever more palpably what the prophet Jeremiah calls “a fire in the bones” (Jer 20:9). The political and racialized ironies are thicker than mud covering a freshly dug grave. The state of Ohio, where I reside, and where Tamir Rice was shot dead in a playground, is an “open carry” state. I wonder, sincerely, in those few fated seconds as the squad car sped onto the scene, and the officer opened fire on the boy within two seconds of arrival, whether an armed witness with a registered weapon, preferably white–i.e. 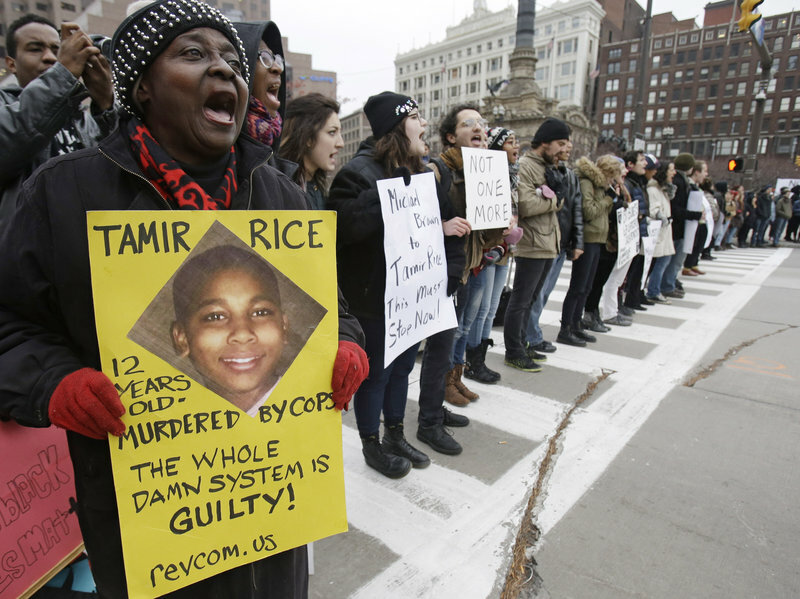 “not dangerous looking, a “good upstanding citizen”–could have legally defended Tamir Rice against the locked-and-loaded police bearing down upon him? If not, why not? Because, as the logic goes, we must presume the police “are doing what they have to do.” The victim “should have known better.” He must have “got what he deserved.” Even if one grants the point (a grand jury did; I and many others do not), what about the rights of our hypothetical, law-abiding, stand your ground, gun-carrying citizen? Gun play in America — joined inextricably with race – is a cynical, ugly, zero sum game. Everybody loses. But with respect to so-called equal protection under the law, it is black folks who end up far more often in the graveyard. As Thomas Merton asked some fifty years ago, does it make sense for Christians to “pray for peace” in our cities, and then to go about our lives as usual? As Merton concludes, God will not help us, God can not help us, if we continue to rationalize state-sanctioned evil under the guise of “procedural error,” “he looked threatening,” or “she had it coming.” The burgeoning statistics are bleak enough, surely, but the names and faces are heartbreaking. (Unless they’re not.) The new normal, after all, is not new. What is horrifying is our accommodation to “the way things are,” our seeming acceptance of realities that should not be. This blog was originally posted on January 16, 2016, on our Blog Partner, Hope Sings So Beautiful. Important post! More people need access to the statistics. I am only now understanding the “new” racism in our country. I used to think of all of this just in terms of poverty, but unfortunately race is a huge variable in the equation. People of color have less access to resources to get out of poverty. Our criminal system is such that blacks are more likely to be caught than whites. People still think of racism in terms of personal attacks on blacks. Racism is not considered on an institutional level. I had a friend by the name of David Fuhr who came to me one day in 1989 and asked my advice on whether or not he should go to the police academy. I was preparing to go back to school in preparation for a career change myself, so I guess David figured I would be the person to talk to since we both lived in the same rural area of south Texas and were both stuck in dead end jobs with no future. When he asked me about the police academy, I said to him, “Suppose you have to stop a vehicle at 3:00 a.m. on a lonely country road with backup miles away. Suppose too that the windows are tinted so dark that you can’t see inside the car, and the driver refuses to follow instructions to shut off the engine and exit the vehicle.” I told him that if he had the nerve to face that kind of situation that in all likelihood he would eventually have to deal with, then he probably had what it takes to be a law enforcement officer. With that advice, and after proposing that scenario to some officers in the Gonzales county sheriff’s office and listening to how they had handled similar situations in their careers, David went to the police academy and was hired as a sheriff’s deputy by Gonzales county Texas. He worked his way up into a position as a narcotics detective and eventually began working as an undercover narcotics agent in a joint task force made up of law enforcement agencies from several south Texas counties. David was killed in the line of duty on the morning of December 6th 2000 while attempting to serve a warrant at a mobile home outside of Luling, Texas. The suspect fired through the door of his mobile and claimed that he did not know David was a police officer in spite of several warnings over the PA systems of nearby Texas State Trooper vehicles. David made his choice to become a lawman. The advice I gave him may have helped push him in that direction, but it was his choice in the end. It takes a particular type of person to do that job. It’s not a job I would ever want. David and I had known each other since high school. With all that said, I’ve looked at the recent well publicized police shootings from a Christian perspective. The Bible tells us we are to respect those in positions of authority, but at the same time, those in authority will give an account to God just like those of us who are not in positions of authority. So we know what God’s word says. But, there is no denying that there is a problem. In spite of my conservative Christian views, I cannot help but acknowledge that something is not right. There is a problem, but it’s not unique or complex. What I mean by that is this; this problem is not exclusive to the black community nor is its effects limited to relations between police and minority communities in America. The problem is related to the overall decay and decline of moral values in America. It really is that simple. Let’s say, for the sake of argument, that you have a certain police officer who has never been introduced to the gospel. Or maybe he (or she) has heard, but rejected it. This officer might be what we call a good person (we’ve all heard that before), but really is not guided by the moral principles of God’s word. Then you have the young black man who likewise has never been introduced to the word of God, or has otherwise rejected it. If or when the officer and the young black man are brought together in a confrontational situation, it’s a bad mix. We allowed prayer to be banished from our public schools. We stood by in silence as all mention of God was removed from our public buildings. Students are arrested for praying at high school graduation ceremonies, and we let it happen. People in this nation shook their fists at God while our highest court redefined marriage. We’ve killed 55 million children through abortion, and even though many Christians claim to be pro-life, they also say they support a woman’s right to choose which in reality makes them pro-choice. No one wants to see copies of the Ten Commandments posted in public because they are what? Offensive? And we wonder why we have these problems. This problem, and all others associated with our moral decay, are not bigger than God. Not at all. As it stands right now, God is our only solution. Faith in Jesus Christ and a return to Christian principles are our only hope. America does not need another failed social program. America needs revival. Will it fix everything? No. Remember, we live in a fallen world and nothing will be perfect until our savior returns and sets up His Kingdom. But we can seek the face of God for guidance. We can cry out for God’s justice when injustices occur, and then we can seek the power of God’s healing.